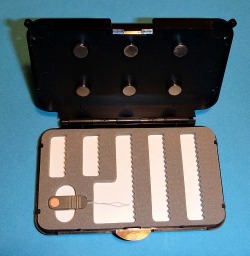 The C & F Chest Patch Threader (CFA-50/THR) holds your flies securely in foam slits. Lots of fly boxes do that. 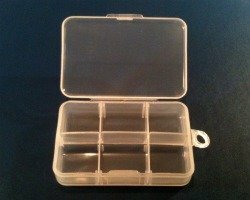 What others don't do, though, is provide sufficient ventilation for the flies to dry properly. The C and F Chest Patch Threader has open ends, allowing flow-through ventilation. You can clip it to a D ring on your vest or use the pin on the back to attach it directly to your shirt or sling. 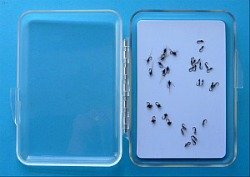 The included Midge sized threader is a big help for any fly (other than those tied on Wide Eyed™ Hooks! ).